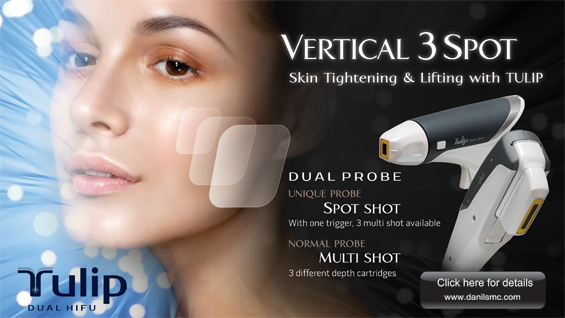 In medicine, unlike in other fields, the 3D technology is used as auxiliary surgical equipment, a guide, implant or fixture, etc. It is evident that 3D printing has wide usage in medicine, however, concerns of safety and biocompatibility limit further application of 3D printing to medicine. Due to the novelty of the technology, safety guidelines and approval standards have not been established even in the US, one of global leaders of 3D printing. Currently, the Ministry of Food and Drug Safety of Korea is in the process of establishing application and approval standards within 2015 and plans to legalize new procedures using 3D printing by the end of 2015. Figure 1. Pre-surgical simulation model. The recent influx of news articles on the role of 3D printing as auxiliary equipment in surgical procedures has caused some misunderstanding. An eye-catching article titled ‘Heart created from 3D printing saves patient’ is actually about a 3D printed model of the patient’s heart being used for simulation before surgery. In fact, a 3D model used in pre-surgical simulation shown in <Figure 1> was available two decades ago. The recent technological advancement has enabled a more convenient and accurate simulation model. 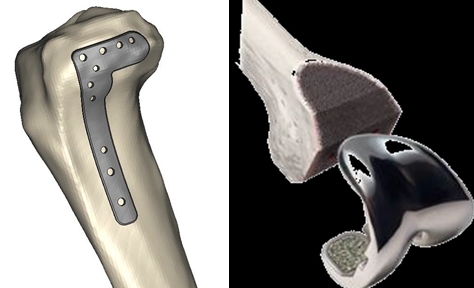 The benefit of creating a simulation model using 3D printing is that it can be widely used in various treatments due to lack of safety restrictions. Figure 2. 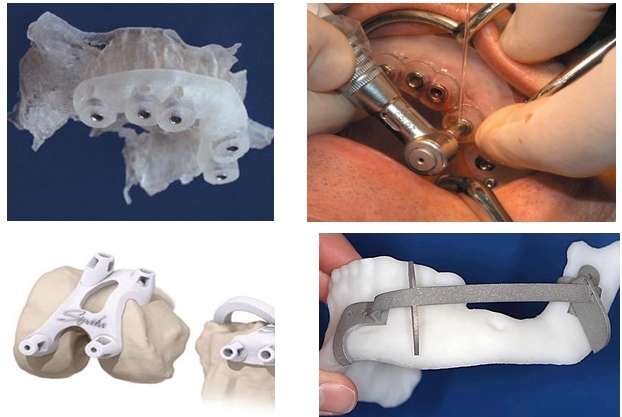 Application of 3D printing in dentistry and orthopedics. The most direct application of 3D printing to medicine may be its role as surgical equipment or guide. The most prominent success is seen in dentistry and orthopedics. 3D printers are used in manufacturing of invisible orthodontics and oral scanners are replacing plaster casts. However, there is a limit to using 3D printing in dental prosthesis due to lower accuracy and restricted materials compared to traditional NC, CNC(cutting) using CAD, CAM systems. 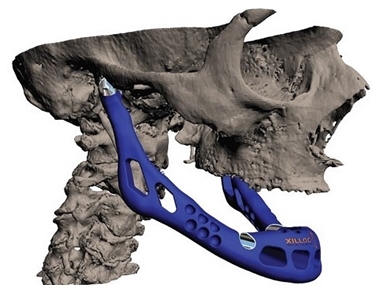 As shown in <Figure 2>, 3D printed devices include a guide for pinpointing a precise location of a dental implant, for location of orthopedic drilling, or for defining the bone resection line in maxilofacial surgery, etc. These guiding devices must meet special safety requirements. As they come in contact with human body, even for a very short period of time, matters such as safety, biological rejection and toxicity, etc. should be considered. However, traditional safety criteria were established before the advent of 3D printing and need to be updated to better suit today’s technology. Various guidelines of FDA, CE, and USP, etc. do not consider 3D printing technology and rely on outdated criteria to assess new technological developments. This area may benefit the most from 3D printing. Fabrication of implants and fixtures that previously relied on the surgeon’s experience and knowhow is now done by a computer using accurate design and production methods. This increases surgical accuracy and shortens the operation time. 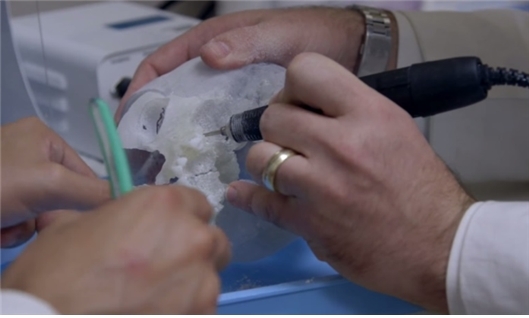 As shown in <Figure 3>, the key advantage of 3D printing is the ability to manufacture an intricate, three-dimensional, and customized plate before surgery. The biggest challenge to this technology is not the lack of technology but the restricted choice of materials. Only a few metals and synthetic polymers can be used in 3D printing. And the number of materials decreases further when limiting to only those that are approved. Even one material had been approved for medical use, a new application process is needed when it is used in 3D printing due to a change in manufacturing process. Clinical study data, toxicity data, and biocompatibility data are needed for approval. However, there are no standards for assessing 3D printing materials and traditional criteria are used in the approval process. This systemic inadequacy seriously hampers application of this new technology. Figure 4. Customized plate manufacturing.